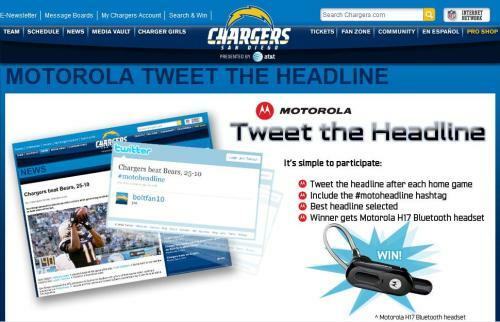 Chargers Fans and Motorola "Tweet the Headline"
The San Diego Chargers have teamed up with Motorola to create an interesting "Tweet the Headline" promotion for fans. Motorola is giving away an H17 Bluetooth headset to the Chargers fan who tweets out the best 100-character headline using the hashtag #motoheadline following each Chargers game. Each week, one submission will be selected to headline a story on the Chargers official website, Chargers.com, and will be featured on the Chargers' official Facebook and Twitter pages. The promotion is terrific because it is a simple, yet effective way to engage fans and incorporate partners via social media.